When guests arrive at this stunning two-story property, they’re sure to be delighted by the beautiful surroundings. 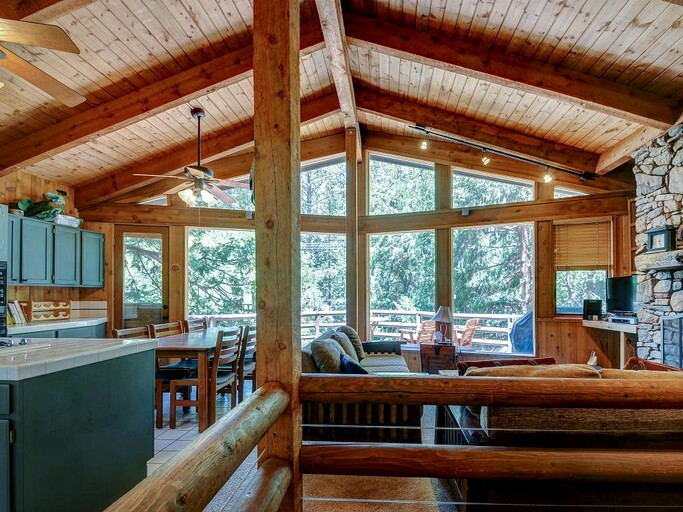 This is a true “log cabin in the woods”, nestled among the tall pines, providing spectacular views of the forest. 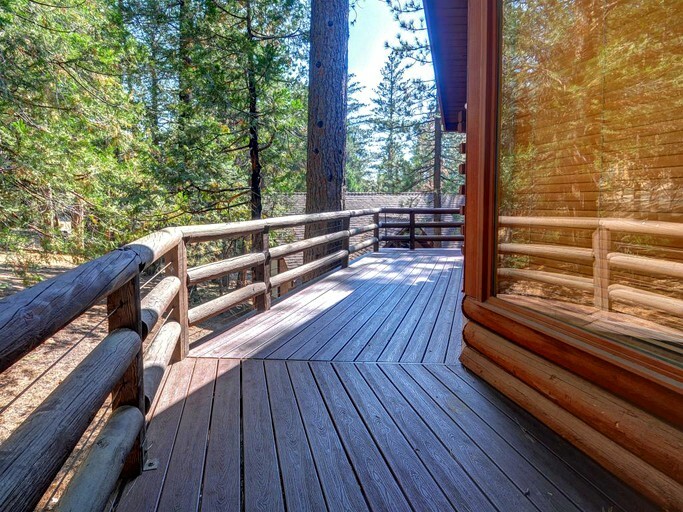 Glampers will love the outdoor space, as this property has a gorgeous wrap-around deck, on the upper-story. 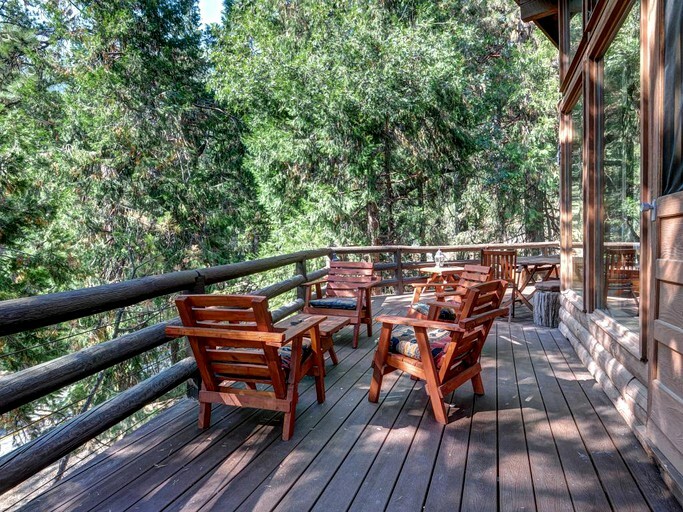 It’s the perfect place to relax and listen to the sounds of the wilderness. 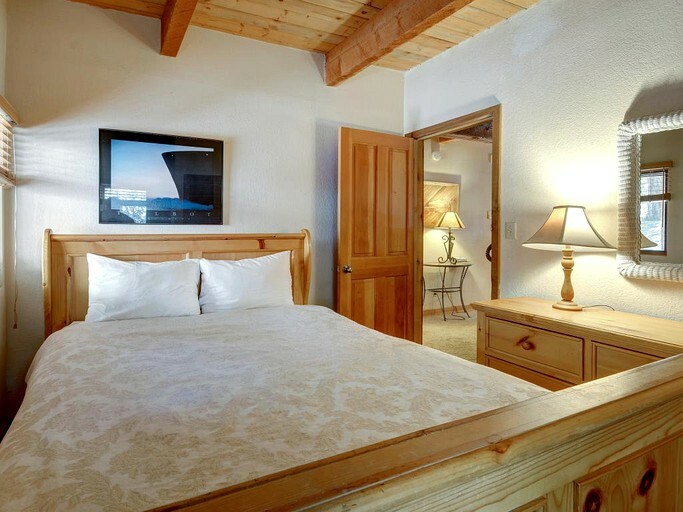 There is plenty of room for up to eight guests to sleep comfortably and soundly in this property. 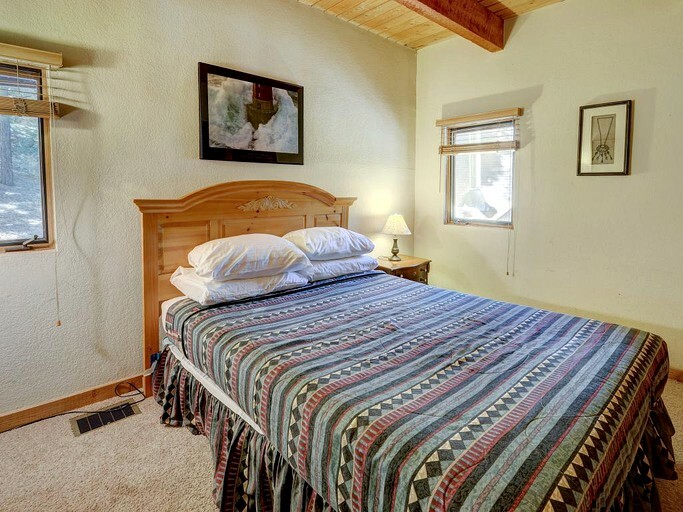 There are three beautifully decorated bedrooms, all with generous, queen-size beds. A comfy double sofa bed completes the ample sleeping facilities. The soft, quilted bedding and shaded windows will ensure that glampers have a gentle, peaceful night’s sleep in tranquil surroundings. Upon waking in the morning, glampers can freshen up in one of the two modern and stylish bathrooms, one of which has a luxurious jetted bath tub. 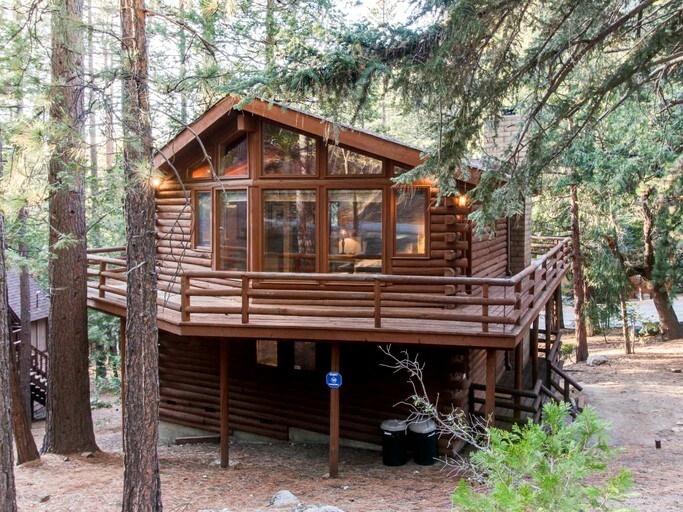 This beautiful, pet-friendly cabin rental is definitely the perfect base for an exciting adventure in the San Jacinto Mountains. 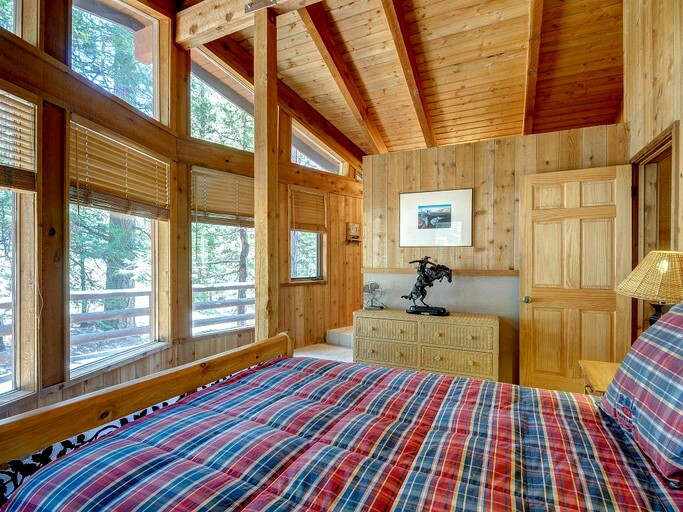 This cabin’s decor is calm and soothing, from the soft, beige-carpeted floors, to the gentle lighting throughout the property. 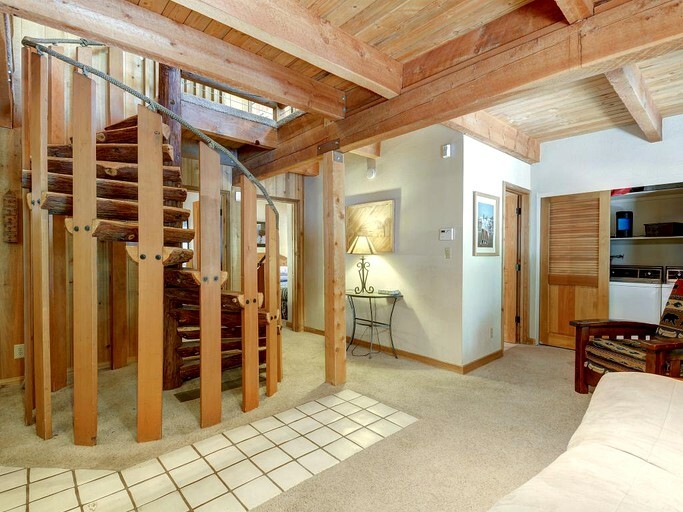 Exposed wooden beams and a winding, spiral, log staircase give the place a warm and inviting ambiance. 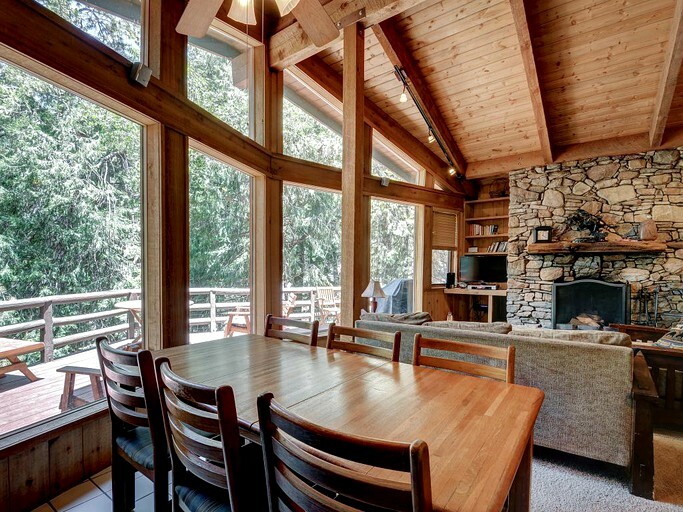 Floor-to-ceiling windows in the living area provide natural light and a sense of being at one with the forest outside. 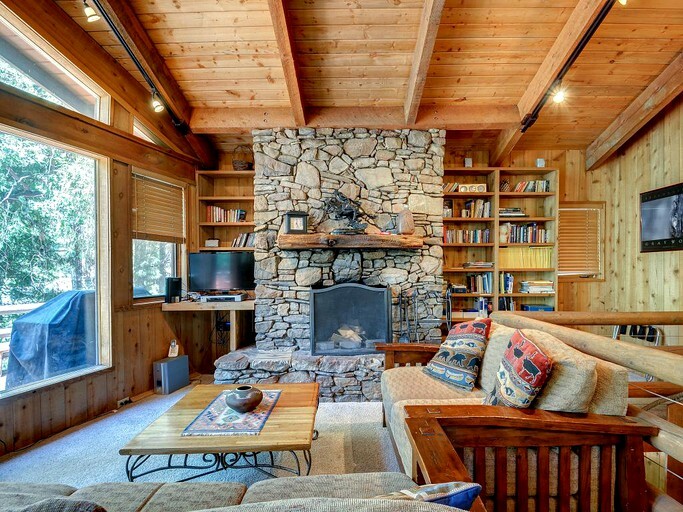 The focal point of the spacious living room is the attractive stone fireplace, with its warming wood-burning fire. The two huge, plump sofas are ideal for when guests want to put their feet up and watch a movie on the big flat-screen TV. 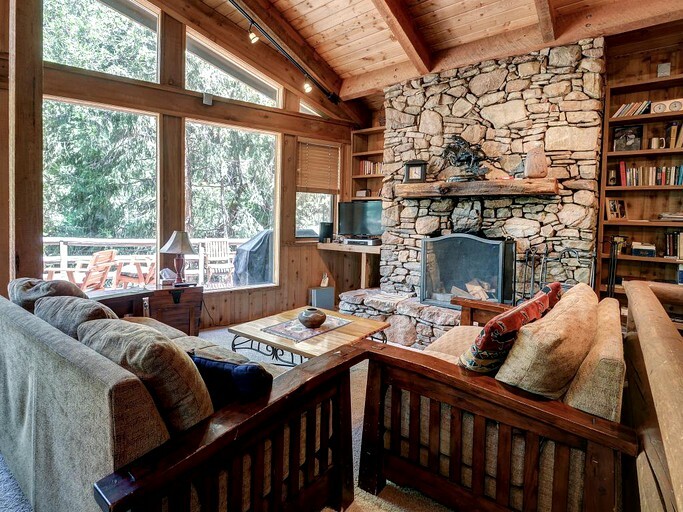 The property also has a DVD player and a great choice of cable channels. Glampers can choose from a selection of DVDs, board games, and books that have been thoughtfully provided by the host. Connected to the living space is a spacious and contemporary kitchen, complete with plenty of convenient appliances. 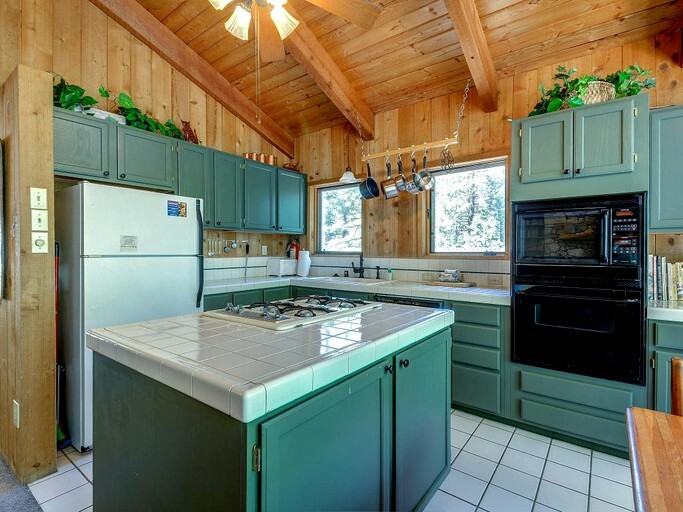 Colorful teal units and polished, white-tiled counters make this an enjoyable place to prepare a family meal, or to sit and chat, with a mug of coffee, at the dining table. From the table, glampers can enjoy the spectacular forest vista from the large windows. There’s no shortage of utensils and dishes, so guests will be sure to find everything they need. After dinner, there’s no need to spend lots of time cleaning up, thanks to the handy dishwasher. 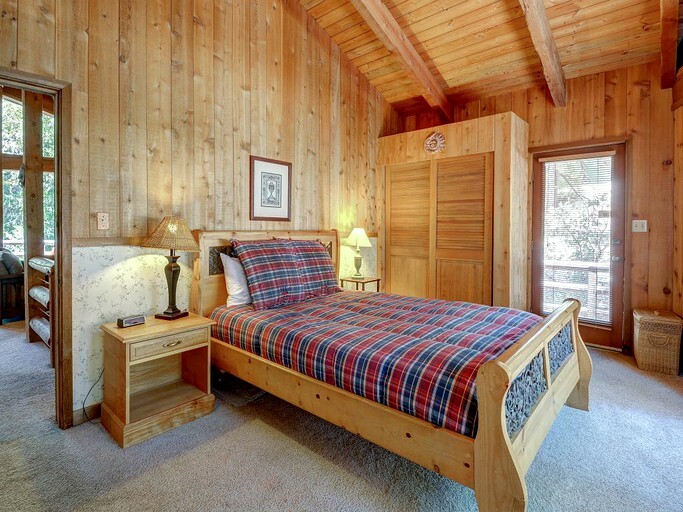 This spacious, two-story cabin is suitable for up to eight guests. 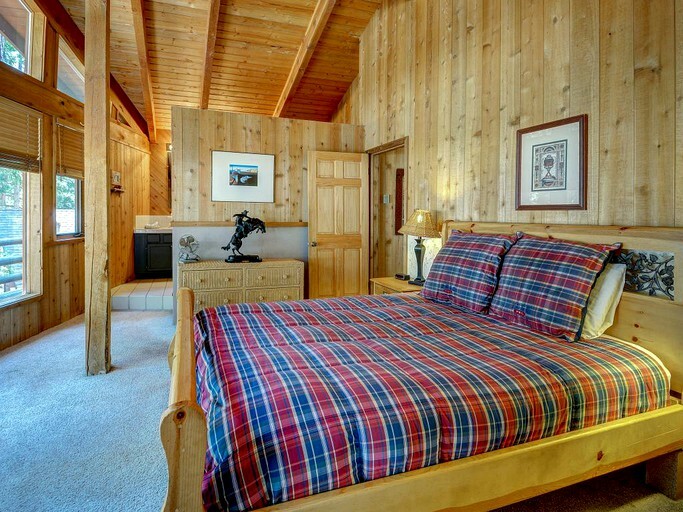 There are three bedrooms, all with queen-size beds, and further sleeping space, in the form of a double sofa bed, can be found in the lounge area. 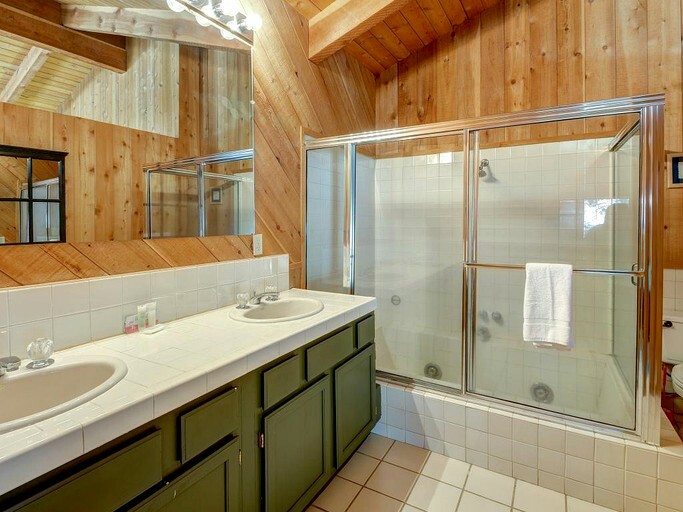 For glampers’ comfort and convenience, there are two well-equipped bathrooms. 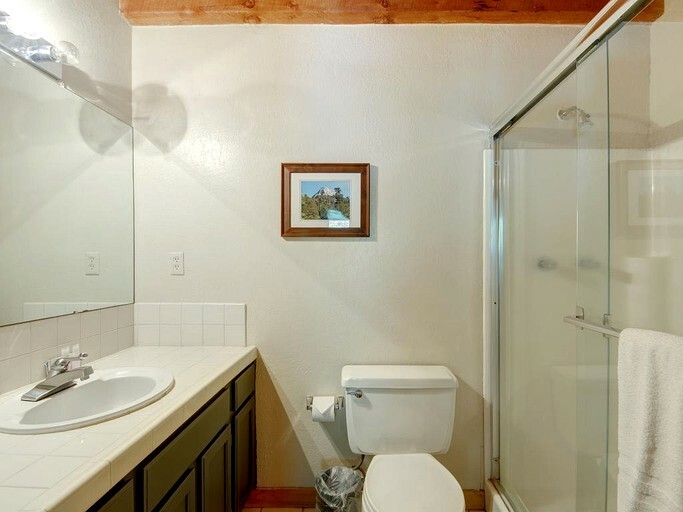 Both have showers, and one has a jetted bathtub. 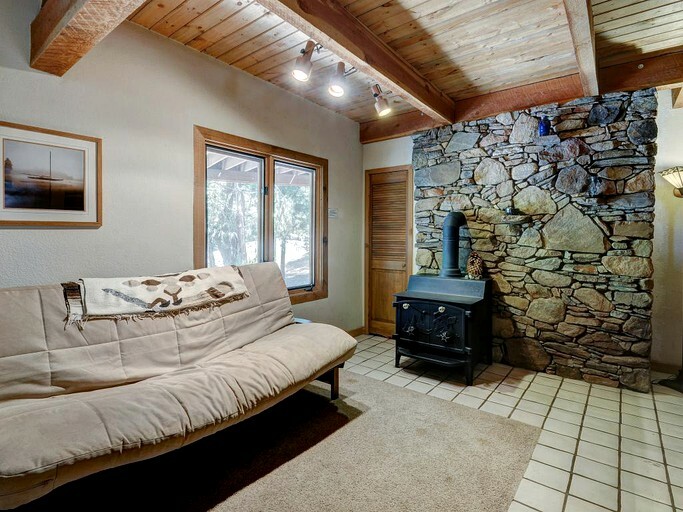 The ample living area features a large, wood-burning fireplace, so glampers can stay warm and snug. 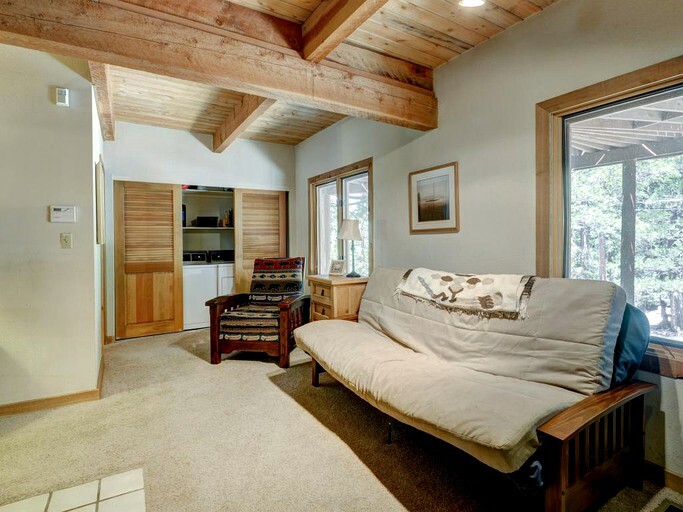 Guests will benefit from plenty of seating space, as the living room has two large sofas. Also in the lounge area, there’s a flat-screen cable TV and a DVD player for entertainment. The host also provides guests with a selection of DVDs, books, and games. 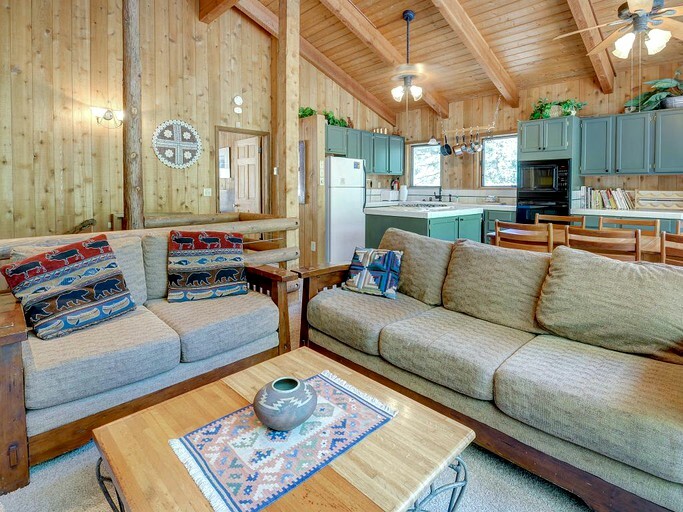 Guests can stay connected using the cabin's WiFi access. 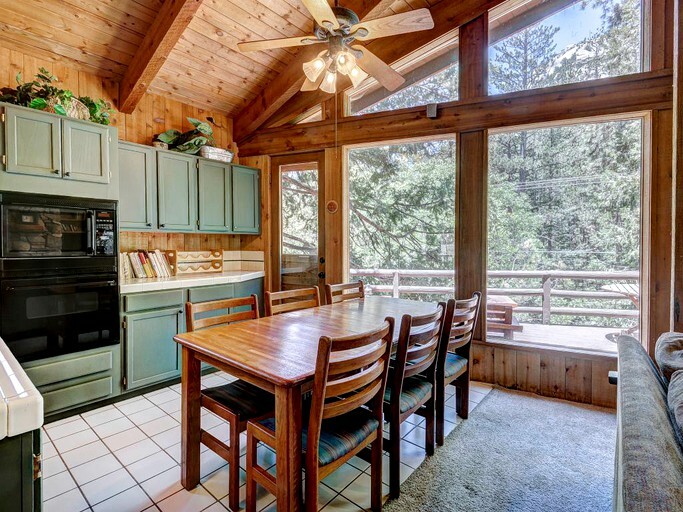 The fully-equipped kitchen boasts many modern conveniences, such as a fridge, a freezer, an oven, a microwave, a coffee maker, and a dishwasher. A great array of cooking utensils makes it easy for guests to prepare tasty meals. A dining table is situated in the kitchen area, at which glampers can eat and drink in comfort. 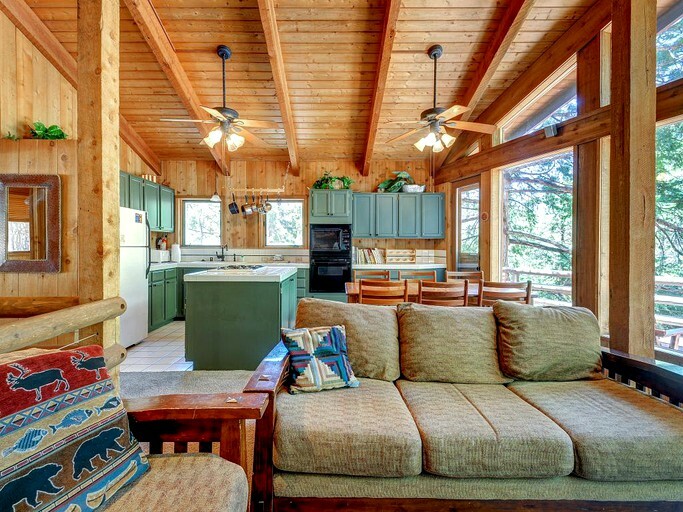 For laundering clothes, the cabin has its own washer and dryer. 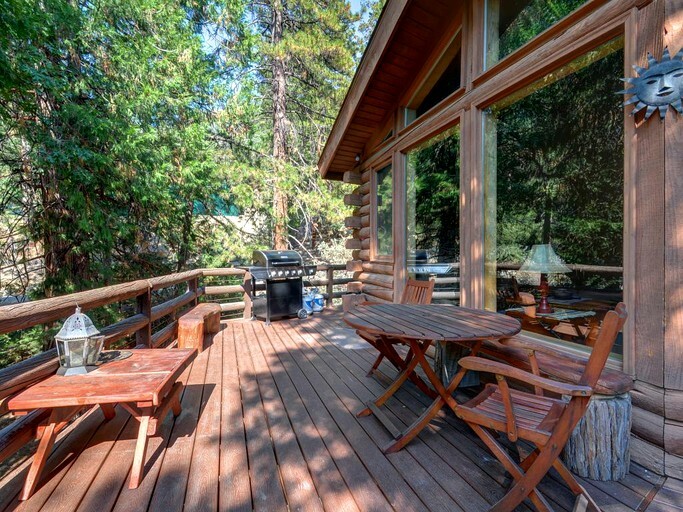 Outdoors, the property has a large wrap-around deck area on the second story, with plenty of patio furniture. There's also has the added luxury of a gas barbecue, giving glampers the option to dine al fresco. 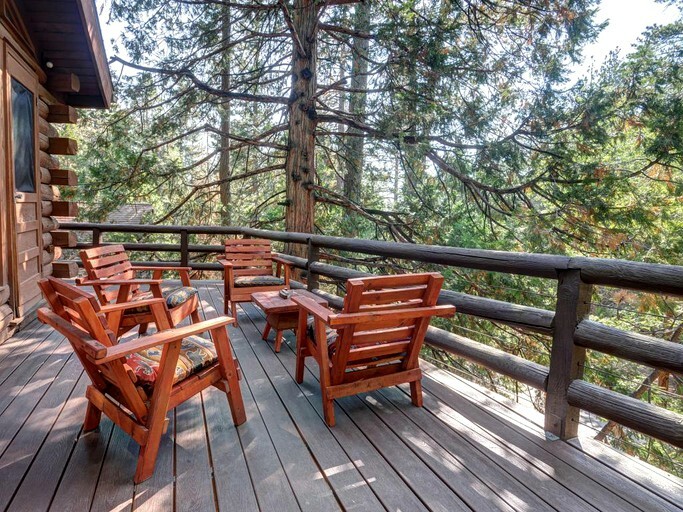 In Idyllwild, guests can enjoy shopping and antiquing in the fantastic selection of eclectic, locally-owned shops. The same goes for dining, as there are several great options in town for a tasty meal. 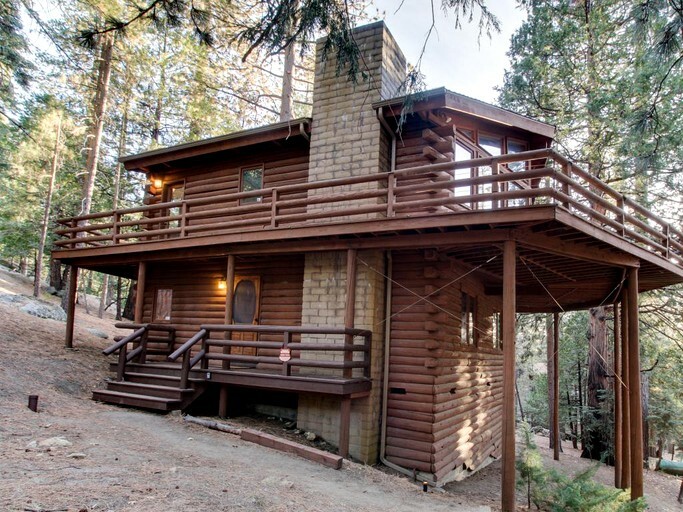 Nature lovers will be delighted by the San Jacinto Mountains, with their beautiful crags, woods, and creeks. There are many opportunities for bird watching and wildlife photography. Some of the creatures that can be spotted include eagles, woodpeckers, coyotes, mule deer and bobcats. Outdoor adventurers can enjoy a host of exciting activities, like mountain biking, climbing, horseback riding, and even swimming. The nearby lakes of Fulmor and Hemet are perfect for taking a refreshing dip. Keen fishermen will love this part of the world, as there’s great fishing to be had in the lakes and creeks. Most visitors to this area come to take advantage of the fantastic hiking trails. 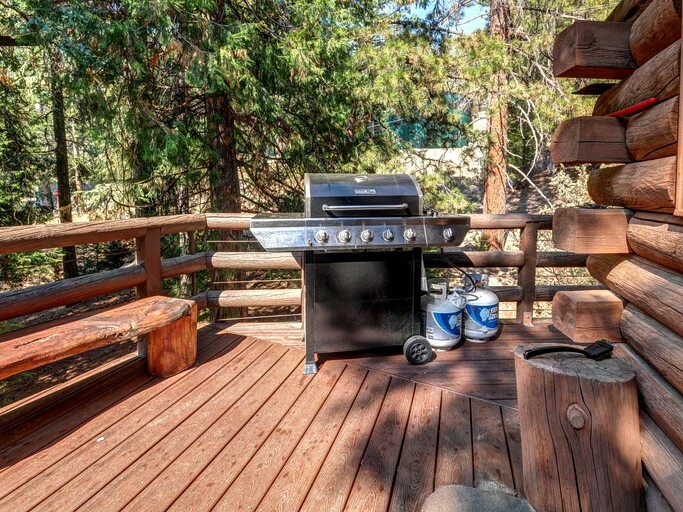 Whether beginners or seasoned pros, glampers are sure to find the perfect hike for them. For those in need of peace and contemplation, there’s always the option to just sit and meditate, as guests will have no problem “tuning out” in these serene and tranquil surroundings. Pets are welcome at the property, for a nightly fee. Due to the cabin's mountain location, 4WD traction may be necessary for access during the winter months.